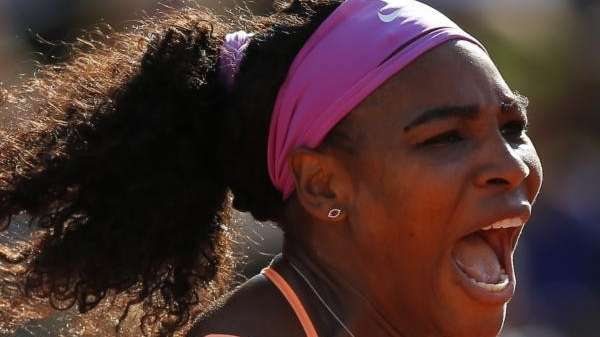 PARIS -- Ill and sluggish, Serena Williams overcame a big deficit to reach the French Open final by beating 23rd-seeded Timea Bacsinszky of Switzerland 4-6, 6-3, 6-0 on Thursday. With the temperature nearing 85 degrees (30 Celsius) on the hottest day of the tournament, Williams walked ever so slowly to changeovers, where even lowering herself to sit down seemed to be difficult. During those breaks, she pressed ice towels against her forehead and neck and guzzled water. Her coach, Patrick Mouratoglou, acknowledged during a mid-match TV interview that the top-ranked Williams has been sick recently. Trailing by a set and a break at 3-2 in the second after 66 minutes, Williams completely turned things around to claim the final 10 games. Now one victory from her third French Open championship and 20th major title overall, Williams faces 13th-seeded Lucie Safarova of the Czech Republic in Saturday's final. "I tried everything. I thought if I lose, I will lose with a fight," Williams told the Court Philippe Chatrier crowd in French afterward. "I tried, I tried. I found the energy. I don't know where, but I found it. And I won. I hope that on Saturday, I hope ..."
Cutting herself off, she stepped away from the microphone, bent over and began coughing. She offered a quick wave, then collected her things and left. Off the court, she got a hug from Mouratoglou, who then helped her down the stairs toward the locker room. Next comes Williams' 24th Grand Slam final, and Safarova's first. The left-handed Safarova eliminated defending champion Maria Sharapova in the fourth round, then held on to defeat 2008 French Open champion Ana Ivanovic 7-5, 7-5 in the semifinals. Williams won despite dropping the first set for the fourth time in six matches at Roland Garros. She'd never fashioned that many comebacks at a single Grand Slam tournament over her long, successful career. When this one was over, finally over, Williams leaned forward and rested her head on her hands atop the handle of her upside-down racket.